Spring is the time of the year where the flower blossoms bloom, the sun shines warmer on the earth, and jeans, woolly shirts and boots are replaced with shorts, t-shirts and flip-flops. It is also the time to shake off the embrace of the winter months. It is a beautiful time of year where everything just seems to come to life. During this time, it almost feels like a necessity to add a bit of colour to your life, and a great way to do this is to buy spring flowers that please the senses. As we will soon be swinging into Spring the 1st of September, many will be on the hunt for spring flowers to buy and send to loved ones. But, which flowers do you send that convey the message of springtime? 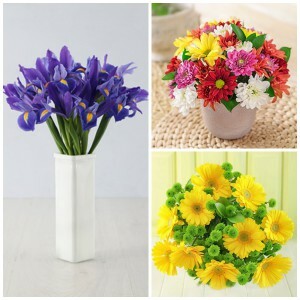 We have selected a bunch of flowers we are fond of for Spring Day for you to choose from. Beautiful flowers for Spring Day – Gerbera Daisies, Tulips and Roses. Roses are popular among many, and as a flower with vast meanings and symbolism, that is no surprise. Roses are the perfect addition to any home or office to brighten up the space for spring. Regardless of the colour, roses are a beautiful gift with their subtle fragrance and beauty. Known for their bright yellow petals and brown/green centre, sunflowers are great flowers for adding warmth and a sunny feeling in a home or office. They symbolise power, strength and positivity as they always turn their faces towards the sun. The world’s most recognised and a favourite amongst many. Since tulips are so popular, they are the perfect gift to a loved one to transition into spring. Send a bouquet of tulips in a variety of colours and brighten someone’s living space. A strikingly unique and beautiful flower, ranging from deep purple and blue to white and yellow. The meaning of sending irises is that of hope. It is perfect as a spring flower, as it gives the hope of new beginnings and bright futures. South Africans will know these beauties by the amazing burst of colour they are part of from August to October in the Namaqualand. Every year the Namaqualand Flower Route attracts multiple visitors, making it one of the largest attractions in South Africa during springtime. 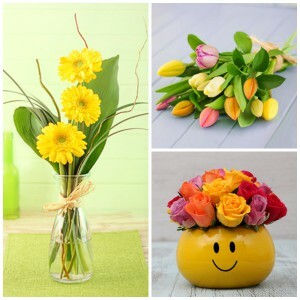 No matter which Spring flower you choose, you can be sure that they will be appreciated by the smiling recipients. Spring deserves to be celebrated, so show some floral happiness to someone special this Spring Day 2016 with NetFlorist!